The ATF has been called in to provide expertise after a four-alarm fire raced through the Millbrae Community center on Thursday morning, destroying a hub where people gather to talk, create art and go on annual Easter egg hunts. Central County Fire Dept. 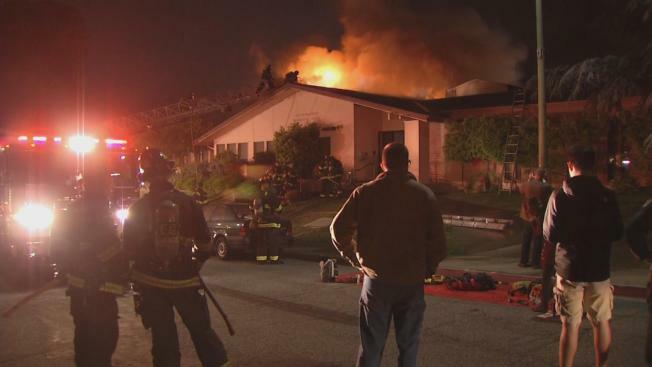 Chief John Kammeyer told NBC Bay Area that a burn pattern on a back wall indicates the fire reported just before 4 a.m. at 477 Lincoln Circle indicates possible arson. His agency has now asked the ATF for a consulation, hoping for the agency's federal expertise. Kammeyer had to call for more resources three times, with as many as 60 firefighters from multiple agencies helping out. The department used a drone to get a better look at the fast moving fire. Kammaeyer said the 1970s tile in the attic made the blaze extremely difficult to contain. "Between the roof and this acoustic tile is where the fire was going," he said. "We’re going layer by layer to determine what was there originally." The entire sight was a shock for neighbors and community members who send their kids to camp and take art classes there. Neighbor Alex Vue was extremely sad to see the building go up in flames. He's attended plenty of Easter egg hunts there. "It's an important part of the community," he said. Added Daniel Hill, who lives across the street. "It's my life," he said. "I basically grew up there." Classes normally held at the Millbrae Community Center were moved nearby to the Caroline Shae Center. The mayor of Millbrae says the city plans to rebuild, starting with a meeting Thursday night to figure out the next steps.